The kids don't like it when mom and dad fight, and my God they weren't the only ones fighting. The Padres and the Pitch characters are all like family, and like family, they know how to get down and dirty with one another. On Pitch Season 1 Episode 10 we saw husband against wife, "brother" against "brother," agent against client, sister against brother, and, well you name it. There were also reunions, make-ups, awkwardness, proposals of the wanderlust variety, and so much angst and feelings, it hardly seemed like it was packed into one hour. God bless Bawson and their awkward, avoidant little hearts. Unlike most of our Pitch Roundtable, I don't have an issue with the potential pairing and I don't think it's forced or abrupt either. I blame Michael Lawson and that intense gaze of his. I'm not typically a person who jumps on the shipping train, but it was hard to ignore that it has been simmering for some time. They have a great chemistry with one another, and it just so happens that their chemistry works in any and every relationship form, be it best friends, mentor/mentee, or that couple with sexual tension who dance around each other for seasons. It's not a new format, obviously, but it's not your standard, status quo relationship either when you really think about it. A potential romantic pairing involving a couple of different races, vastly different ages, in different points of their lives (one rising as the other is coming down) somehow still inextricably linked and meeting in the middle? Not something I've seen a great deal of or at all. It's unique, as are they, and not as reductive or cliché as it may initially appear. I also love the idea of the first woman in major league baseball still being valued as a romantic/sexual being, when they could attempt to downplay or erase it to fit a "pro-feminism" narrative, that in actuality would be anything but and just as harmful as the alternative. I don't typically advocate for romance, because it's something I can take or leave when I'm watching something. However, I do know that it isn't something that diminishes a character. The only real problem is when it's used to define a character. Ginny is such a complex, amazingly written character that romance, regardless of who it's with should never be stripped from her because she's already proven she's not just that. In fact, robbing her of it or waving it off, would fit into some misconception about a woman in sports having to forego femininity to be "one of the guys." Which is why the idea of Bawson didn't faze me, and the reality of Noah was so satisfying to watch. I love Noah to pieces. He's quite the smooth talker but he's so genuine and real, and he's really good for Ginny. The Bawson tension becoming awkwardness when reality hit them wasn't surprising. They're the slow-burn, I suppose. Neither was their retreating to other relationships. There had to be one voice, my voice. So I did the thing that scared me the most. Permalink: There had to be one voice, my voice. So I did the thing that scared me the most. I just really loved Ginny's so much better. Noah is another person, much like Cara, who could provide Ginny with experiences and support that she was deprived of for years and needs. They were so adorable on their date, but when he was so honest and insightful as he talked about the path he took to becoming the billionaire nerd he is now, I fell for the guy myself. It resonated with Ginny because it was the exact sort of message she needed to hear. Noah: Or boat, I also have a boat, that has to be said. Ginny: I wouldn't even know where to begin, I've hardly been anywhere. Noah: Then let's go everywhere. Permalink: Then let's go everywhere. And his proposition to take her wherever she wanted on vacation could have easily been obnoxious and flashy, but the delivery was so earnest and sweet. Especially when paired with the knowledge that Ginny hasn't traveled much or had fun. It was such a fantastic moment. On the flip side, Mike reuniting with Rachel just didn't feel right at all. I like Rachel a tad bit more than when she was first introduced, and I do respect their genuine friendship, but the yo-yo-ing seems unfair to both of them. I was more invested in his most important relationship on the show. His friendship with Blip. Mike: I'm the Captain here, Blip. I'm doing my job. Blip: You gave that job up when you gave up on this team. Are we just going to keep pretending like that didn't happen? Watching those two go at it physically hurt, because their friendship has been one of many highlights of the season. Blip felt hurt, betrayed, and abandoned and Mike's inability to really acknowledge just how hurtful he was made things between them extremely tense. Mo McRae has been the dark horse of this season. 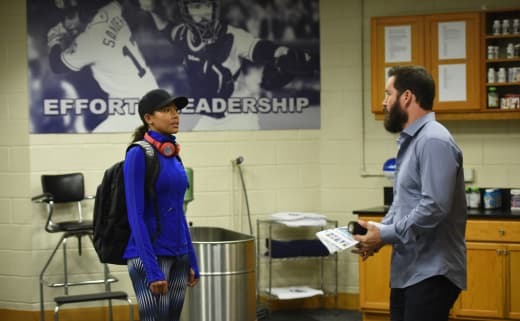 It's so easy to get wrapped up in Kylie Bunbury and Mark-Paul Gosselaar's incredible performances every week, or Mark Consuelos, Dan Lauria, or your pick. But Mo has been a quiet force. He's serious and thoughtful when necessary. But also humorous, with great comedic timing and delivery when it calls for it, and he's a side-eye king. He's a scene stealer, and he was amazing this episode, between his tension with his bro, Mike, or the tension with Evelyn. And boy did that hurt too. They're the epitome of #RelationshipGoals. I knew that the restaurant idea renewed some long abandoned fire in Evelyn and she would want to stick with it, Will or no Will. I think I'm done. Having kids. Permalink: I think I'm done. Having kids. I understand both sides of this. Evelyn gave up her education and potential career to be a wife and mother, and dealt with others judging her or dismissing her as a result. Blip sometimes does it without thinking. The comment he made about her having a daughter to go to the spa with made me cringe.With the twins in school Evelyn could pursue other things that can fulfill her in different ways, but if she has another baby she'd have to out all that on hold again. Blip just wants things to stop changing. The poor guy is a creature of habit, and change scares the crap out of him. The Will storyline has been irksome, but I'm relieved to see that Ginny does know her brother and what he's capable of. She set him straight. It unfortunately led to a blowout with Amelia, but honestly, it was a long time coming. It got really ugly. I've commented on Amelia being understandably protective of Ginny but having boundary issues. A lot of their issues (and my issues with her, though I love her) would be resolved if she communicated better with Ginny and didn't treat her like a kid. Ginny has repeatedly told her about this, and Amelia is too focused on thinking she always knows best. Amelia loves Ginny and it's obvious that Ginny means more to her than just a client, but she has to be more honest, respectful, and upfront with her. She was so on point about Will, and she couldn't let it go. I didn't always care for her approach but I understood it. But things will always get messy when you're interfering with someone else's family affairs. One day you're going to regret this. One day you're going to be at your lowest point and you're going to need someone. And it's not going to be your dead father. It's not going to be your conman brother. It's going to be me, and I'm not going to be there for you. I didn't care for her comments she made to Ginny, not that she wasn't allowed to feel attacked, because given how close she is to Ginny it would be a slap in the face to be reduced to her job. I hated it, because again, a lot of it could be avoided if Amelia communicated better. It has to feel stifling knowing that everyone expects so much of you, and everyone has so much say in every aspect of your life, but it really had to be frustrating when someone who means well continuously leaves you out of the loop or meddles in every aspect of your life and doesn't tell you about it. Blip and Mike, Blip and Evelyn, Ginny and Amelia, they all know how to go for the jugular don't they? You only hurt the people you love. Hey, we gotta shut her down Al. Permalink: Hey, we gotta shut her down Al. Of course the action (and some of the humor and angst) came from Oscar wanting to call the season for Ginny. For once, I agreed with him. Plus Ross had the numbers to back it, and numbers don't lie! It was great to see Josh Peck again, I wouldn't hate it if he became a more permanent fixture. Ginny may have made a point about the difference in ligaments for women and men, but I would presume she has to throw harder and exert more than her male counterparts so she would burn out faster. Al and Buck were not trying to pull Ginny early. They have become her biggest advocates and it warms the cockles of my wee heart. In hindsight, they really should have listened to Ross the intern. Hell, they should have listened to Oscar and Blip too. It was painful watching Ginny lying there on that mound, because her arm gave out on her as suspected while she was pitching a no hitter. And right after that great speech that can be found here. I loved how the finale ended with her giving Mike a talking to on the mound versus how it begin with him giving her one. It was very fitting and a nod at just how far she's come in just a few months. It was more soul-crushing to watch Amelia, ever the woman of her word, board that plane after she saw the footage. And now, Ginny has pushed away her close ones, shut down, and her career is hanging precariously in the balance because she was too bull-headed to listen to others. I loved that the entire scene played out with what has become the signature Pitch tune, "Have No Fear" by Black Violin, playing in the background. Such a great sendoff for our fearless protagonist. Pitch Season 1 has been such an amazing experience. There is not much that I didn't positively love. The quality, writing, and content have exceeded my expectations. And the cast is one of the best on television. My only hope is that the journey continues (knock wood) and that we get much more of these rich characters. Including the other Padres. I don't know about you, but one of the highlights of the series is watching the team, be in Stubbs, Salvamini, Duarte, and dear, sweet Omar come to love and rally behind Ginny as one of their own. I'd love to know more about those characters too. So what did you think of the season finale? Did anything about the finale surprise you? Are you upset that Amelia left? Are you happy that they put the Bawson romance on hold? What do you hope to see next season? Hit up the comments below! 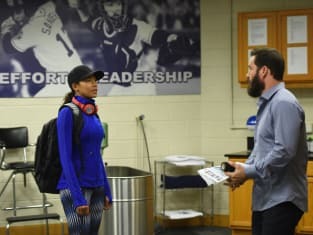 It's been a great experience watching Pitch, and if you want to relive every amazing moment of this show you can watch Pitch online right here at TV Fanatic.